You are here: Home / Breed Profile / True Terriers! Energetic, intelligent, athletic, fearless…a Jack Russell Terrier never tires easily…these little bundles of energy are suited to different dog sports such as flyball or agility. Born hunter: Jack Russell Terriers were bred to hunt down foxes which escaped and hid underground during hunt. Pooch in the iconic HMV logo: You all must have seen the logo of HMV (His Master’s Voice), wherein a dog is looking and listening to a phonograph. Well, that dog is Nipper, a Jack Russell Terrier. First pooch to travel to both North and South Poles: In 1982, Bothy, a Jack Russell, owned by explorers Ranulph and Ginny Fiennes, became the first dog to travel to both the north and south poles. 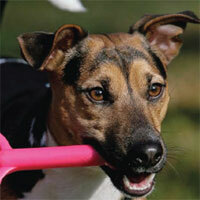 The saviour pooch: George, a Jack Russell, saved five children from pit bulls attack at a carnival in New Zealand. He was posthumously awarded the PDSA Gold Medal in 2009. People in Manaia, New Zealand pay tribute to him at his statue built in his memory. Paw stars: Whether it is Bear, Gene Hackman’s pet in the 1995 movie Crimson Tide or Max, who played the role of Milo, Jim Carrey’s (Stanley Ipkiss) only friend in the 1994 movie The Mask, Jack Russell Terriers know how to rule our hearts. Other famous movies featuring Jack Russells include Mr Accident (2000), Hotel for Dogs (2009), Paul Blart: Mall Cop (2009) and Beginners (2010). More recently, Uggie, another Jack Russell Terrier, featured in two blockbusters – Water for Elephants and The Artist. The campaign ‘Consider Uggie’ was launched in December 2011 on Facebook for Uggie to receive a real or an honorary Oscar nomination. However, Uggie received a special mention at the Prix Lumière Awards in France and the Palm Dog Award at the 2011 Cannes Film Festival. The pooch in the book: Published by Scholastic, Jack Russell: Dog Detective is a series of adventures of a Jack Russell dog and his friends. This book is authored by Darrell and Sally Odgers. Some unusual things revolve around Jack Russell which we have not paid much attention! Let’s find them out. Jack Russell boasts of amazing agility as this small breed can jump five feet high fences easily. Having bred with hunting instinct, Jack Russell chases his prey even beneath the ground by digging. His thick waterproof coat helps him in this task. A female Jack Russell named Tillie paints with her paws and claw strokes. She conducted 17 solo painting exhibitions at Milan, Amsterdam, Brussels and Bermuda and sold more than 100 paintings. The National Geographic Channel documented a Jack Russell called Tokkolas who nurtured a lion cub and a cheetah cub as mother. http://www.dogsandpupsmagazine.com/wp-content/uploads/2013/08/True-Terriers2.jpg 134 250 Dogs and pups Magazine http://www.dogsandpupsmagazine.com/wp-content/uploads/2017/05/1254nal.jpg Dogs and pups Magazine2013-01-20 15:00:352014-02-07 17:40:31True Terriers!